If you want to decorate your kitchen with more than one color then, a combination of three colors is best suitable for it. Like in this kitchen, there is a combination of three colors, such as white as a base color, grey for giving it a contemporary look and cherry color for adding life to it. Use of grey is here to match kitchen with other areas of home like living room, which is in grey color. Cherry color is giving this kitchen its own identity, while being a part of one contemporary home, also adding an intimacy to this area. A carpet with lighter shade of cherry is adding warmth to this kitchen. Glossy white kitchen cabinets are giving a blank canvas for decor and design opportunities. They give one timeless choice for design with options for designing directions in plenty. 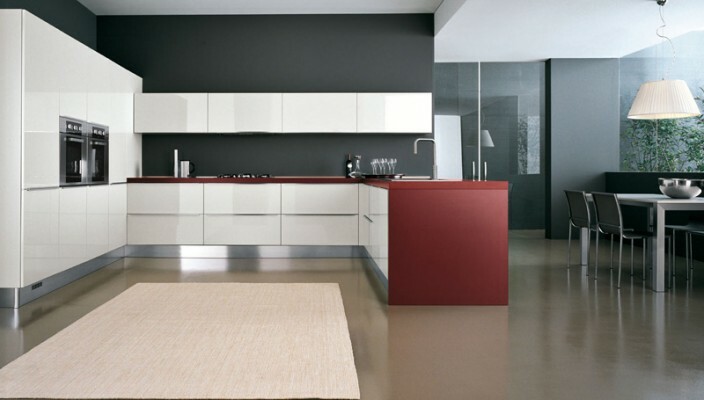 With a color combination like this you can choose from contemporary, minimalist and modern look.